The Lord of Huntingdon Over Tunic can be worn alone or with any under garment. It is shown here with our Huntingdon Brown Under Tunic (sold separately). 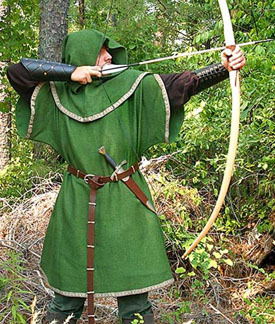 The “archer’s” sleeves fall freely open when your arm is raised, while the full hood allows for perfect anonymity. Both tunic and hood are edged with a brown medieval trim. 100% cotton. Choose from sizes S/M or L/XL. Pictured, related items listed below are sold separately.